March 20, 2016 by Scrum Ronin·Comments Off on What Colour is your Organisation? 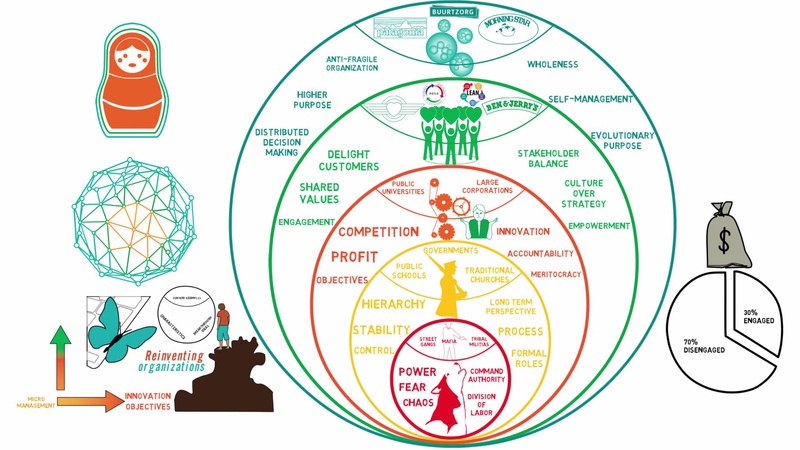 Frederic Laloux’s acclaimed book Reinventing Organisations describes how every time humanity shifts to a new stage of evolution it also achieves a radically more productive organisational model. Around 10,000 years ago with the invention of the division of labour and command authority, humanity started combining small tribes into chiefdoms with small associated armies. In integral theory these are labelled Red and are crude, reactive and often violent groups. The chief is like a predatory wolf pack alpha-male using fear to keep order within the group, with family members often in charge with the belief that they can be trusted. Crime syndicates such as the Mafia or Triads, street gangs, tribal militias and terrorist groups are all current examples of Red organisations. Around 4,000 years ago with agricultural advances humanity entered the Amber stage with state bureaucracies and organised religion. People learnt self-discipline and self-control working together with strong group norms. With clearly delineated castes Amber thrives on order, control and hierarchy. Formal roles and a static organisational chart led to stable, replicable processes to be followed with paternalistic-authoritive leadership. Do what is right and you will be rewarded in this life or the next but act outside of your role or the group norm and you will be punished and expelled. Bureaucratic Amber organisations include the Catholic Church, the military and most government organisations (schools, police etc.). With the Renaissance, Enlightenment and early Industrial Revolution the Orange paradigm started to replace Amber. 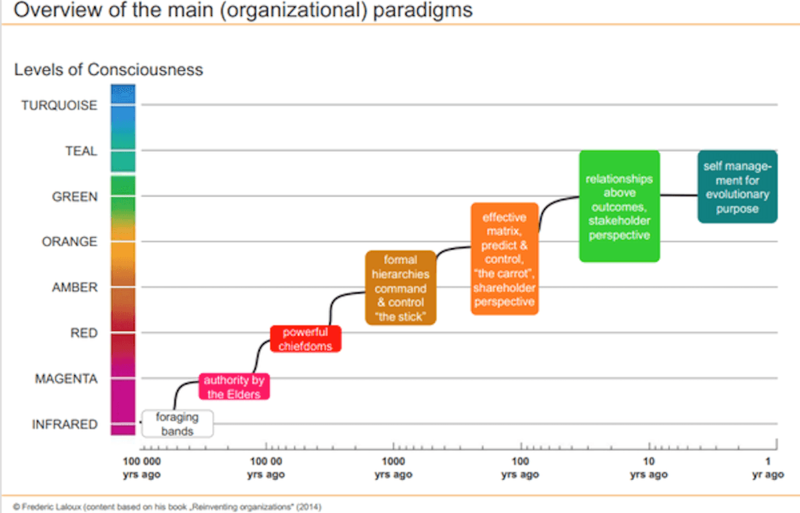 In Orange, organisations are machines to be understood and exploited with scientific investigation. The morality of Amber is replaced with goal and task oriented effectiveness and decisiveness driving rewards. Innovation created new departments including research & development, marketing and product development. Accountability allowed leaders to move from commanding people to using freedom and rewards to motivate them. Management by objectives led to HR, budgets, KPIs, annual evaluations and bonuses. Meritocracy held the possibility of people rising to positions based on their qualifications, skills and achievements. The machine metaphor led to the adoption of engineering terms using inputs and outputs, information flow, bottlenecks and reengineered process. Orange has also led to short-term thinking, rampant exploitation of resources, corporate greed and overconsumption. Most modern companies are Orange, especially multinationals and investment banks. Since the middle of the 20th century forward thinking companies have been investing in culture, values, coaching, mentoring and teamwork. Green companies value cooperation, collaboration and coopetition over competition and beating others. Equality, tolerance and fairness are all important for the organisations, serving not just shareholders but wider stakeholders, including their customers, employees, suppliers, the local community, the environment and the wider business community. Higher costs in the short-term and a more inclusive nature have been shown to create higher long-term profits. The metaphor for Green organisations is a family where everyone is respected and listened to and decisions are consensus based. Green companies are a balance of culture, a wider skilled powerbase and a large reduction in hierarchy. Examples of Green organisations include Southwest Airlines, Starbucks and the Container Store. Wholeness: Whereas Orange and Green organisations focus on individual’s professional selves, Teal organisations look at inner wholeness and rightness, purpose and self-expression. This removes the work façade or masks from people enabling them to be themselves and bring energy, passion and creativity. Evolutionary purpose: Agile practices that sense and respond quickly to stimuli replace heavyweight planning, budgets, targets and extrinsic incentives. The guiding metaphor for Teal organisations is a living organism working within a larger ecosystem to deliver value to all of the stakeholders and realise their potential. Teal organisations are not focused on profits but instead try to further their mission. This has proven highly successful for many of the Teal organisations but is not a simple job pushing forward with organisational change based on collaboration and everyone being equal. It is not that a heroes do not exist in Teal organisations but more everyone is equal and all heroes. Examples of Teal organisations include Zappos who use Holacracy, Sun Hydraulics, Helligenfield and Morning Star. Firstly it is never that simple, organisations will include a range of cultures but within a single geography and under a specific management structure or CEO a single organisational culture type will be dominant (often that of the CEO). Secondly, one organisational colour is not intrinsically better than any other colour so avoid being caught up on progress or attainment (very Orange of you). Looking across organisations there is a lot of variation in culture, from team to team, between programmes and departments and over geographies. In the UK large companies are predominantly Orange, in India and China with historical hierarchies and caste culture the major model is Amber. Red – The manager specifies the bonuses for each person buying allegiance and rewarding behaviours that reinforce their personal control. Amber – Salaries are tied to the role that individuals perform with the same rank having the same pay. Incentives and bonuses are not used as everyone is expected to perform their job. Green – The reward structure is generally more extrinsic where success is celebrated and teams enjoy spending time with each other with company barbecues or even holidays. Teams can be awarded bonuses as a whole to encourage cooperation but this may be in the form of budgets they can collectively spend on whatever they wish. Teal – With full self-management there is a change in the reward system, 360 reviews are useful but other alternatives such as specifying your own salary increase are common. With honesty and transparency linked to an advice structure, individuals can have the autonomy to select their own salary increase. There is also a problem when you are working with one organisational culture and your team/department or company has another. This is seen clearly when coaching organisational change. Michael Spayd at his recent London meetup described how it is not possible to individually change a company’s culture and instead your focus should be on creating the best example of its type. Keep a look out for his forthcoming book Coaching the Agile Enterprise (due mid-2017) for more detail on this. For example, if I was coaching a team in an organisation with a strict hierarchical, command and control Amber culture then I would avoid initially focusing on self-organisation and empowerment for teams. Instead I would first get the team collaborating and delivering value incrementally in short iterations. Once success is proven, velocity increasing and the team continually improving, then further progress with the organisation can be made. Take a look around you and compare the organisational stages and key breakthroughs with what you see. What colour do you consider yourself and what of the team you work with and the organisation as a whole? Now you understand where everyone is, think about how you can work best with others and encourage growth and fulfilment.